Are you the OnePlus 3T Android phone users, here is a good new for you. The new OxygenOS 4.0.0 Android Nougat Update is now leaked for the OnePlus 3T devices. With this new update, you can enjoy all the Android Nougat features on your OnePlus 3T phone. 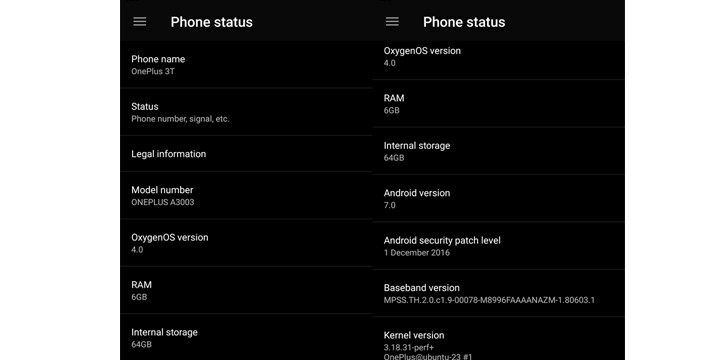 The update is not officially released, its a leaked version nd one of the famous XDA developer innocentwoolf captures this new OxygenOS 4.0.0 Nougat Update for OnePlus 3T. Here ion this guide we will show you how to Download OxygenOS 4.0.0 for OnePlus 3T Nougat from below and flash it manually. This guide is only for the Oneplus 3T users and don’t use this method on any other Oneplus Phones. Read all the instruction very carefully and follow all of them step by step on your phone. Make sure to take the full backup of your phone. So lets get started and install the OxygenOS 4.0.0 Nougat Update on OnePlus 3T. Visit the below mention link and Download Android Nougat Update for OnePlus 3T, and save the ZIP file on your phone’s internal memory. 4. Connect the Android device and open a command prompt or terminal on your PC. To do this open the ADB folder press shift + right click and click on open command here. 5. Reboot your OnePlus 3T device into stock recovery mode. 6. Now from the main screen of the recovery, tap on the first option that says “Install update via ADB”. 8. Now the update will start, and this will take some time. 1. Download the OxygenOS 4.0.0 Nougat Update zip from above and save the zip file on your phone internal memory. 4. Locate the ROM zip file & flash it. 5. Now wait until the process complete and then reboot your device. That’s it. Now your Oneplus 3T is running on the Official Android Nougat. Let us know if you have any questions by comment below. as many others out there I’m on a rooted 3.5.3 / 3.5.4 with twrp installed. What’s the best way to upgrade to 4.0.0 with root?